Stonemason’s Streets Of Asia 1, 2 & 3 – 3D Model For DAZ Studio – Review – Which Is Best? Stonemason is one of the best 3D modelers in the DAZ 3D marketplace, heck, he’s one of the top 3D modelers in the world. His specialty is really in texturing and bringing surfaces to life. His widely popular Streets Of Asia for DAZ Studio series now consists of 3 props, and if you don’t own all of them yet, which is best? What are the pros and cons? To start with, they all look great. While Streets Of Asia 1 is the oldest one, it’s also the larger of the three, offering plenty of scenery and camera angles, especially as far as height goes. However, it’s also the one with the least amount of detail. 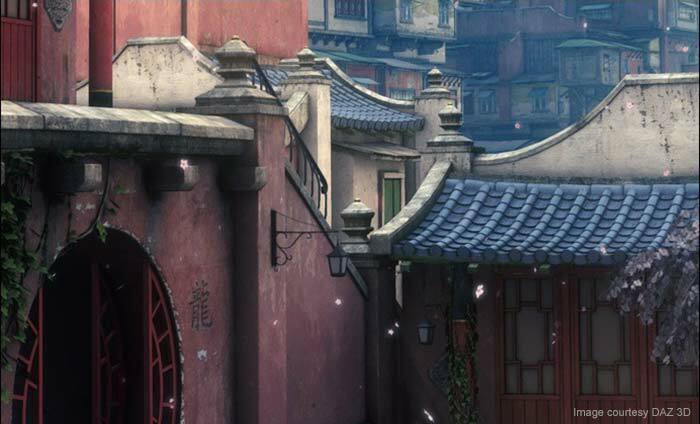 Streets Of Asia 2 is the perfect mix of medium-large scenery and detail, while Streets Of Asia 3 offers the most amount of detail, especially in the shape of trees and foliage and is also the smallest of the three. These props can be easily exported into your favorite 3D application. Check out the props at DAZ… Streets Of Asia 1 here, Streets Of Asia 2 here and Streets Of Asia 3 here.